Makani Enhancers™ are deployed for wide-area network ("WAN") optimization and application acceleration. Makani's patent-pending technology and breakthrough Latency Buster™ architecture makes core IP services through optimized protocol handling, app-aware acceleration, and management services available through a single platform. The Makani Enhancer can be deployed in-path or as an out-of-path appliance. 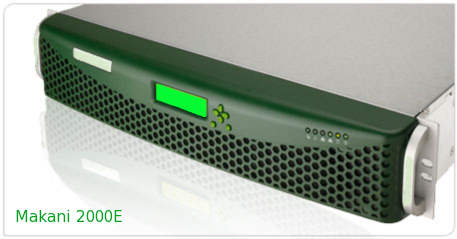 The Enhancer consists of multicore processors and a specifically-tuned (MakOS™) operating system. If an Enhancer fails - indeed, if all of your Makani Enhancers failed at the same time the only consequence would be that no additional data would be optimized and accelerated. Makani platform consolidates multiple processing functions at the front end of the data path. Only traffic that requires service-specific treatment is passed up the services hierarchy for processing. For customers who wish to optimize and accelerate more data, multiple Makani Enhancers can be clustered together.